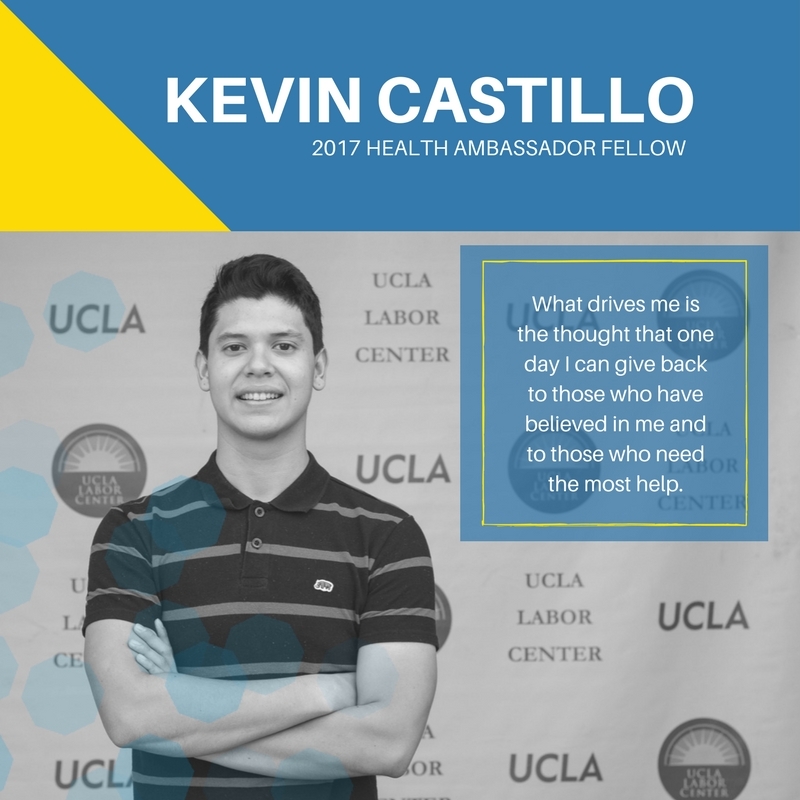 Kevin Castillo is a Health Ambassador Fellow based in Los Angeles County, specifically working in the Boyle Heights and Pico-Union areas. Kevin works at Clinica Romero, a healthcare center where he informs communities on health programs and educates undocumented immigrants about their rights to access health services. In November 2011, Kevin arrived to the United States at the young age of 14-years. At that early age, he had the notion of doing well, and living a better live. “I came to this country with the mentality of always giving my best as a person, and as a scholar so I can go to college and become a successful adult,” Kevin said. However Kevin’s journey would come with obstacles along the way; it was a few years upon his arrival that Kevin learned he was undocumented in the country. “My family, and I were vulnerable to all the bad practices and injustices that have been applied to other undocumented immigrants in the past. Kevin continued, “Therefore, I started to get involved in activism.” He’s currently in his second year at California State University, Los Angeles, studying Business Administration and Accounting, with a minor in Finance. The defining moment when Kevin decided to get involved specifically with Undocu-Health work was when Kevin saw his parents health depleted. He realize there was a lack of health resources for the undocumented community. Kevin participated on the #Health4All initiative, and currently, Kevin plays a major role as a Health Ambassador Fellowship. My family in general. What drives me is the thought that one day I can give back to those who have believed in me and to those who need the most help. I was a Dream Summer Fellow when the Dream Resource Center announced its Health Ambassador Fellowship in which they stated that it was an extension of Healthy California Cohort. So, as a fellow interested in the undocuhealth field, I applied and I got in. I have learned to be a leader. When a person enters the immigrant activism, one important thing to learn is how to be a leader and have the initiative to keep fighting anything that is against the undocumented community. It has made me grow personally and professionally. It has provided me with experience of team work and it has made me have more initiative in starting projects. After the fellowship, I will keep going to school to obtain my Bachelor’s degree, then get my Certificate in Public Accounting (CPA) and then my MBA. Graduating from my Master’s Degree in Business Administration (MBA) and be a Certified Public Accountant (CPA), will prepare me to fight for a financial reform. I’d like to tackle on shrink the wage gap of CEO’s to Employees, control corporation’s habits of misleading their financial statements through auditing, and forensic accounting. To manage your time wisely, it can become hectic if time management skills are not developed. Also, to always stay positive. Being positive is a must as an organizer because people will see you as a leader. The community needs reflect those of my family, and the social problem of my community faces is also my problem. I like to exercise, dance, and embrace into the financial world through books.